Indiana i/ɪndiˈænə/ is a U.S. state locatit in the midwastren an Great Lochs regions o North Americae. 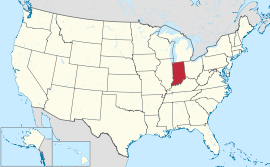 Indiana is the 38t lairgest bi aurie an the 17t maist populous o the 50 Unitit States. Its caipital an lairgest ceety is Indianapolis. Indiana wis admittit tae the Unitit States as the 19t U.S. state on December 11, 1816. Indiana mairches Loch Michigan tae the northwast, Michigan tae the north, Ohio tae the east, Kentucky tae the sooth an sootheast, an Illinois tae the wast. Afore acomin a territory, vairyin cultures o indigenous fowks an historic Native Americans inhabitit Indiana for thoosands o years. Syne its foondin as a territory, settlement patterns in Indiana hae reflectit regional cultural segmentation present in the Eastren Unitit States; the state's northrenmaist tier wis settled primarily bi fowk frae New Ingland an New York, Central Indiana bi migrants frae the Mid-Atlantic states an frae adjacent Ohio, an Soothren Indiana bi settlers frae the Soothren states, pairteecularly Kentucky an Tennessee. Indiana haes a diverse economy wi a gross state product o $341.9 billion in 2016. Indiana haes several metropolitan auries wi populations greater nor 100,000 an a nummer o smawer industrial ceeties an touns. Indiana is hame tae perfaisional sport teams, includin the NFL's Indianapolis Colts an the NBA's Indiana Pacers, an hosts several notable athletic events, sic as the Indianapolis 500 an Brickyard 400 motorsports races. ↑ "Table 1. Annual Estimates of the Resident Population for the United States, Regions, States, and Puerto Rico: April 1, 2010 to July 1, 2015" (CSV). U.S. Census Bureau. December 24, 2015. Retrieved December 24, 2015. ↑ William Vincent D'Antonio; Robert L. Beck. "Indiana – Settlement patterns and demographic trends". eb.com. Retrieved January 3, 2012. ↑ "Gross Domestic Product by State". bea.gov. U. S. Bureau of Economic Analysis. May 11, 2017. Retrieved September 6, 2017. This page wis last eeditit on 4 Dizember 2017, at 05:04.